The Lidget Compton Concrete Garages have different roof depending on the garage supplied. Normally the Pent and Pent Deluxe garage ranges will have corrugated galvanised steel roof with anti-condensation treatment. The Pent Mansard garage will also normally have this type of roof but with the additional attractive raised roof at the front which has Metrotile galvanised steel roof tiles in 6 different colours. The Lidget Compton Apex standard and Deluxe concrete garages will have a 12½ degree pitch on the roof. 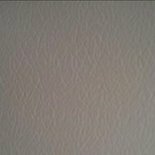 This is covered with B5 fibre cement roof sheets which are normally natural grey or can be supplied in a choice of 6 different colours. The Lidget Compton Apex 15 has a steeper pitch of 15 degrees and an attractive B7 Bold Roll tile effect in terracotta colour finish. The Lidget Compton Apex 20 has the steepest pitch which is 20 degrees. 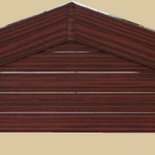 Clad with the delightful Metrotile roof tiles in a range of 6 colours. The standard Lidget Compton Concrete Garage pent roofs are made from corrugated galvanised steel roof with anti-condensation treatment, which ensures no annoying drips from the roof. 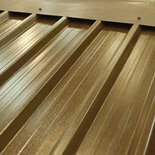 There is an chargeable option for a galvanised box section profile roof which is coated on the outside with a Plastisol coating and is maintenance free. This is available in Black, Light Grey, Dark Grey, Olive Green, Terracotta and Dark Brown. 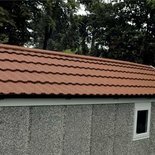 The Metrotile roof is standard on the Lidget Compton Apex 20 concrete garage and is available on the Pent Mansard range as an option. The steel roof which is galvanised has several layers of protection which is capped with a layer of granules. Finally a colour is added which can be Charcoal, Brindle, Green, Terracotta, Red and Bronze. This is a very attractive option. The Lidget Compton Concrete Garage Apex range has a 12.5 degree pitched roof, and is clad with Fibre cement roof sheets as standard, in a natural grey colour. 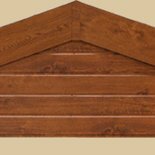 There is an option for six different colours of roof coverings and are Spanish Red, Blue. Olive Green, Black, Brown and Terracotta. 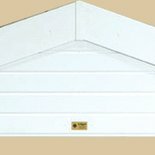 On all Lidget Compton concrete garages there are timber fascia boards as standard, except on the Apex Deluxe and Pent Deluxe which uses PVCu as standard, however on all garage models there is an option to choose the superb maintenance free PVCu boards. You don’t have to choose White as there are two Decograin timber effect options which are Light Oak and Rosewood. To save money why don’t you ask about our special Maintenance Free Packages which include the PVCu fascias as standard and will save you money.